Christmas. Getting is good. Giving is better. Once you understand that, it’s always Christmas – Doogie Howser, M.D. Bangued, Abra. As I was going out of Jollibee from a meeting, a boy approach me from behind. Tapped my shoulder slightly. I turned around and saw a sad face staring at me. He was wearing a tattered shirt and shorts. His slippers are old and dirty. He extended his frail hands. “Sir Merry Christmas” he said softly. He looked so tired and I can sense he is very hungry. I gave him money and told him to go inside Jollibee and buy some food. His eyes lit up and manage to smile as he ran towards the glass door entrance. I was about to drive off when the boy ran back towards me. I asked what happened. “Sir didak met pastreken” he said as he was about to cry and pointed to the security guard. “Apaya?”, I asked. He didn’t reply. I was sure he wasn’t allowed because of the way he look. I got out of my car and took his hand. “Umay kan. Siak maka ammo”. His hands were cold and sweaty. Obviously he was a little bit scared. The guard open the glass door and he saw me with the boy. He didn’t say a word. We proceeded towards the cashier. The place was packed like there’s no tomorrow. The place is loud and the cash register continues to ring. I thought to myself this establishment must be making millions every month. I am no longer a customer of any fast food since I decided to quit eating junk food. But because of fastfoods massive advertisement campaign, they make it so appealing to everyone specially the young ones. But that’s another story. With the boy in tow, we took one of the several lines of cashiers. Judging from where we are, the wait coul be 15 to 20 minutes. So i decided to talk to the boy. His name is Leonel James. He’s only 11 years old. He came all the way from Bacsil (by foot) to pan handle around Bangued. He is the oldest among 4 siblings. His other siblings are 8, 6 and 2 years old. I asked him, who is/are with him. “Adda kakadwak tattay sir ngem pinanawandak”. I can sense that’s he’s beginning to relax with my presence. I ordered spagetti, burger and a coke. Surprisingly he doesn’t want French Fries. I told him, we will order take out so he can enjoy eating his food outside because of the chaos inside. We finally got our order after 20 minutes. Got out of quickly handed his food. He grabbed it as if his life depends on it. He finally was beaming with smile and said “Thanks you Manong” as he started to ran towards the town plaza. I shouted “Merry Christmas”as I followed him with my eyes. He disappeared amidst the crowd… I look back at the guard and give him a blank stare. He bowed his head and looked away. I wonder how many more “”Leonel” out there who became invisble to the eyes of our society? How many more of them being left alone and forced to survive on their own even at their very young age? If we cannot provide this…we failed as a society. To my readers, I wish everyone a Merry Christmas and A Happy New Year. If you happen to see a “Leonel”, please extend your help…they need it! Thank You for letting Leonel feel that he is loved and that someone else’ cares. I wish each and everyone a Merry Christmas and praying that all of us will share what little we may have to our less fortunate brothers and sisters. I believed that charity begins at home and so I say, Abra is our home. Make someone happy today and everyday by sharing anything we can, from words of encouragement, spiritual upliftment, physical nourishment and simply by not taking advantage of people’s weaknesses…We may have so many different ideas, beliefs and political views but in the end what matters to all of us is peace and harmony…let us all work for it, from our leaders to constituents, let there be peace and happiness. Hope this is an EYE OPENER to our Governor and Mayor of Bangued. How many more Leonel will they create because of their never ending corruption and no clear social services to their respective constituent. Have heart if you still have them Mr. Govah & Mr. Mayor, even just for the sake of Christmas Season. Thank you for a very moving story that made me think how propesterous our politicians are. And thank you for every “Leonel” in Abra and elsewhere in the Phil. for they are the ones who may open the eyes of our corrupt politicians to change. By my humble computation with every towns’ IRA, if the Mayors allocates funding for food for the poor citizens in their town, nobody will get hungry. Corrupt politicians, here is how you can do it: Stop pocketing IRAs, implement a program in your own town to feed all poor citizens regardless of their party affiliations. Merry Crhistmas and a Happy New Year!!!!! How many more Leonel and Sysop left in the province or elsewhere but we tend to ignore them because? This is a heart-breaking story that if only we salivate and emulate it, peace and prosperity will truly reign in our midst. But what really hinders us is our lack of faith or cowardliness to embrace the only way in changing our fate in life. Instead, we allowed unrighteous politicians to rule our lives miserably which no one knows when and if it still end. Right, they have the guns, money, and right connection to intimidate or influence the majority voters, but it doesn’t mean we ran out of ways already to stop them. They say, change starts from within in everyone of us, but how? How could you change yourself if you’re so afraid to face their political leaders with scary bodyguards surrounding them especially if they hang rolled money at the end of the barrel of their gun and they commanded you to just grab it, or else? Then this effective tactic spreads all over the place where no one from the authorities concerned seems alive to do something about it. It’s so sad that not even our honest President could prevent these thieves from running again on the next coming election. So, what else then to be our last and only remaining hope if everybody remains faithless coward? I think there’s still a way, if it seems no other ways, and there’s nothing to lose if we try to use whatever available wisdom that we could find from the Bible. Jesus said: I am the Way, the Truth, and the Life. No one could enter in His Father’s Kingdom except through Him. My understanding is: we could not live our earthly life to the fullest (because of corruption and killings) nor enter in His Kingdom in heaven unless we will sincerely repent and ask forgiveness of our sins, force ourselves to stop sinning, and humble ourselves by being forgiving and compassionate to others like Sysop did. If we can do this, although we are the worst thieves and criminals on the face of the earth, I think He will still reward us by more than enough COURAGE to stand firmly with our own feet and tell to the thieves, right up on their face that: ENOUGH IS ENOUGH, we are now determined to vote the likes of Sysop and Dr. Neil to run our lives. But how could you fully Christianize these coward majority voters if the different religious denomination themselves are lazy to do what they were supposed to do because not even one % of the so-called righteous people are eager to donate a little bit of their hard earnings for food and travel expenses of these poor disciples? Well, I might be wrong, but still I’m very hopeful that honest christian political leaders will emerge, run, and win for any public elective office in the next election, courtesy or as a reward of the Divine courage to be shown by our brave electorate. As a result, no one could deny that together with the disciples of Christ, they will be called as our unsung heroes. If not with their unconditional love with our Creator, this electorate would have not been enlightened until now with the wisdom from Above. Merry X’mas and Happy New Year to everyone! Yes, there are some Scriptures or Words full of wisdom that could be found from the pages of the Bible. I beg you to find them and share with the lukewarm believers here, idolaters, and to those who wants to end their satanic ways. Who knows, you might be one of their bridges in transforming their lives for the better here on earth and beyond? Fellow Abrenians bloggers lets start the REVOLUTION OF CHANGE in ABRA with the story of Leonel, coz i believed there are far more worst story of poverty in Abra compared to Leonel, some family in abra just eat once day because of this leeches (Linta) politicos in our province. I do not understand why Goovah was so irresponsible in tackling such perennial problem. Our bangued Mayor keep on squeezing the people of Bangued by imposing his Revolutionary Tax where in the end it is the poor populace of bangued who is being squeezed because of high prices that is being created by his own revolutionary tax. The question is. Is CHRISTMAS in ABRA is only for those politicos who enjoy abundance of their loot? Do they really deserved this? Where the spirit of Christmas is all about the nativity of JESUS CHRIST. Can we call them (politicos) Christians???????? This is very sad reality….Thank you for sharing this story. SAPAY KOMA TA MABASA DAGITI MASEKNAN NGA DADAULO . 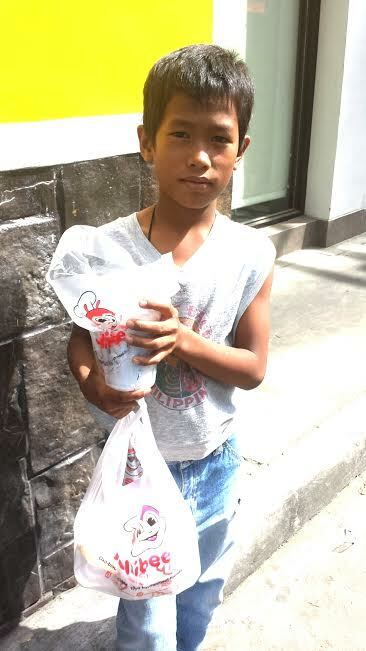 Sharing our blessings, especially for the less fortunate like Leonel is God’s delight. What you have done sir Sysop maybe Leone’s best experience in his young life. His experience is a dream of some 30 percent of our countrymen who continue to be sad this xmas because of extreme poverty.In God’s love to the world,, Did not only share but gave His begotten son to suffer and die for our us sinners. His sacrifice and your modest show of concern to Leonel should be a food for thought and an eye opener to our corrupt leaders. If only these whom we trusted learn to value the spirit of sharing and giving, life in this world would be less cruel and God would surely be delighted. Because he said ” what you have done to others, you have done to Me.” Our hope for change is to continue to pray for God’s power to melt the heart of these heartless.leaders. We trust when He said ” Ask and it will be given….,seek and you will find, knock and it will be opened”. Well said Tagamasid, but I believed this Abra provincial politicos have different religions, who believed only on money & power. If they can squeeze further they will do that up to the last drop from the poor people of Abra. And favor only those who serve them and allies. This poignant story of Eric’s experience with Leonel James is a tale that is every so often repeated in our benighted province. It is a sad reminder of how government has failed us. Leonel is even luckier than many others because he can still go to Bangued. Scores of our people in the far-flung barangays and hinterlands do not have the luxury of being able to go to Bangued. Imagine the state of disrepair of roads going to and from the remote municipalities and perhaps you can begin to picture how the greater portion of the IRA and pork barrel funds have only found their way to the pockets of our callous and heartless officials. Advent is a season of renewal and repentance. It is a season for sharing as well. May all the so-called leaders of our province find it in their hearts to think of the welfare of the great masses of our people for a change. May God enlighten them and touch their souls. May they stop trying to appear blameless for the sad lot of our people. It is never too late to change. May I take this opportunity to wish Eric Bringas and his family and all fellow Abrenos a Blessed Christmas and a Grace-filled New Year. At one point, Jesus has no place to go and is starving. He desires however to be accommodated for him to share the truth of God. His message boils down to this important teaching” Love God with all your heart and soul, and love people as you love yourself”. As Christians do we understand this message of Lord Jesus? If so, it is not how much food we do prepare on Christmas eve, but how much we exemplify his message in our life. There are many stories of love and sharing during Christmas seasons like the story of apo Eric Bringas on Leonel. This is more of a parable to understand the true meaning of Christmas. Merry Christmas to sir sysOp and to all unwavering individuals who wishes for change in our beloved province. English gakong ka met bodong… Itnegem laengen namaymayat pay. Use of verbs and nouns etc problema ta English gakong mo. Merry xmas lattan bodong wish you better english for next year…. For the Year 2013 the Wind of Change has not reach Abra. Merry xmas fellow bloggers sysop and gob takit . Very touching story. We all know that after the last elections. There is no TRANSFORMATION done. Now that election is months over. Where is ASENSO ABRA? Where is ASENSO BANGUED? They just made some people think that they are stupid of choosing them. I am not against the current administration. But in what can we all see right now. This is not right. How many leonel will walk kilometers just to ask something from other people who have what they are wishing of? Instead of staying at home celebrating Christmas with their familiy? How many young people will be forced to ask for money and food desperately because of hunger? How many leonel will walk around holding sacks and exploring what’s inside of a garbage. Our province needs more jobs. But unfortunately they cant provide because upon sitting on their throne. Those jobs are reserves for their friends and allies. Its all them sharing the wealth. Smiling, while others are seeking for a job just to survive day by day. Well. Merry christmas to leonel himself and his family. We just hope in their generation. They can see and feel different abra than today. Merry christmas to all. Christmas is a moment when one has to reflect and change his way of life. Free from committing the 10 commandments. You can find a story like this, hypocrite story from supsup, any where and anytime from somebody. Supsup do what you preach and show us a better and Godly living to project good and fulfilling kind of life. Again do what you preach bro! Sus,,,,,,, “Just Once” awan pay ti nakapudno dita Ten Commandments nga kunam manipud pay idi naiyawat ken Moses dayta. Aglalo tatta panay pilisopo ti tattao. Annia aya ti galad ti maysa a Christiano? Maysa kadaguitoy ket ” No tungpaen da ta kanigid nga rupam iyawat mo pay ta kanawan”, Padasem man ti tumungpa kadaguita rumrumuar dta simbaan. ti Kasayaatan agaramid ka latta ti NASAYAAT iti mata ti DIOS ken padam a TAO. Iti dayta makapudno ka. Adu la amin a taltalatawen, kasla dayta kasuron mo ni Sysop awagam pay ti Supsup, nasayaat ngarud dayta? no di ket langgong. Pudno BODONG, awan nakatungpal ti 10 nga bilin.Gaput panangayat t Dios ti lubong, naisakrificio ni Jesus tapno ti darana ket ugasanna ti basol tayo ket t mamatti Kenkuana, ket saan nga mapukaw no di ket maisalakan. Kasano tayo nga maisalakan? ” Lapsutem amin nga nagbasulam, maadaan ti baro nga puso ken ispiritu…….., saan Ko nga pag ayaten nga madadael ti uray maysa; agbabawi ti basbasol,dumawat ti pammakawan , maadaan ti baro nga puso ket agbiagka. Ezekiel 18:31,32. Awan sabali nga makaisalakan ti kararua/biag ti maysa nga tao no di bukod na bagi. “The soul/person who sins is the one to die……..”; Ezekiel 18:20.” The wages of sin is death………” Romans 6:23. The story of the prodigal son tells how a loving king loves his son and gave his son his inheritance even when he was still early in his manhood. Daydi baro, naglawlaw, nagpaimas ti biag, inibos na amin nga tawidna inganat nagrigat. Nalagipna na ni amana, nagbabawi ket nagsubli. Inawat ken pinakawan ni Amana. No saan nga nagsubli, kasano koma nga ayaten ni AMA . The father maybe our Loving God. How could a siinner like us be accepted by God if we don’t like to return to Him? Adu nga kuarta ti namnama? Uray Mano nga kantidad, mano nga kararag ti sabali no nataykan, awan maaramidanna kas nadakamatkon. So for you leaders of Abra, especially those in their twilights, The Lord is waiting for you. He knows everything that we do. Remember, He is imnopresent, omnopotent. What you have done to others, you have done to Him. No agaramid kayo kas rebbengengyo ti kinalenteg nga napno ti ayat, ikarkaragmi ti Dios nga maadaan kayo ti talna ken ragsak uray ditoy daga ken lalo sadiay baro nga daga nga awan ton ti rigat, sansangit, sakit no di ket makapnek nga biag nga agnanayon. Sapay koma ta kasta. We hope for a better New Year. No kasdiay ngarud saan nga relihyon ti makaisalakan no diket ti bukod na a bagi ti tao, banag nga awan serserbi daguiti agkaraiwara nga relihyon ditoy Bangued nga mangibagbaga a isuda laeng ti maisalakan. Ngem ti pagaammok awan pay nagsubli a natay nga nangibaga no sinno ti pudpudno a relihyon. makaulaw pay ti kianaadu dan, isu nga no annia tay naringak a Katoliko isu lattan. Ti rason ko, di pay nagbuteng a natay ni Presidente Marcos a Katoliko siak ketdin nga nakbab-baba a tao ken haiskol lang ti nagadalan na. Wen babsat BODONG, SAAN NGA RELIHYON TI MAKAISALAKAN TI TAO. Nadakamatkon no kasano ti pannakaisalakan: panagbabawi ken panagpakawan ti basbasol, panangpabaro ti puso ken espirito babaen t panangtungpal ti 2 nga katan-okan nga bilinna. Dagitoy ket simple laeng: Ayatem ti Dios ti sibubukel nga puso, biag( soul), nakem ken pigsam ken ayatem t padam nga tao kas bagim. Pudno met nga awan pay nagsubli nga pakaamuan ti pudno relihiyon nga makaisalakan.Ti panangtungpal ti sursuro ti Bibliya laeng t pakaisalakanan. Pammati( faith) ti tulbek ti pammati ti kinapudno ti Dios. Ni Jesus. Kuna ” I’m the way the truth n d life. No one can go to the Father except through me”. Masapul nga patien nga immay, natay gaput basol ti lubong ken agsublinto manen nga agari t baro nga daga.Wen saan tayo nga agbuteng nga matay ita,ta t natay awanen puotna,rekna, ken ammona. Ngem ti patay no agsubli ni apo Jesus ti kabuteng tayo. Agungarto amin ket mahusgaran sigun ti aramidna ti rabaw t daga,The holy book says ‘ the sinners will be consumed by the eternal fire, while the righteous will enjoy eternal life with abundant of peace n love under Jesus governance on earth. Pagayam Tagamasid, allow me to share my thoughts on your word “Judgment by fire”. Many things in the Bible were written figuratively. I may say that the word “fire” is a symbolic one. In the book of Ecclesiastes 1:4, it says: “A generation goes, and a generation comes, but the earth remains forever”. This clearly states that the earth will stay forever. Malachi 4:1 prophesied that Jesus’ day would be a day of destruction by fire; in John 5:22 and John 9:39, Jesus is to cast fire upon the earth. But Jesus never brought about a judgment by literal fire. So what do these verses mean? They must have a symbolic meaning. In Jeremiah 23:29, God says that His Word is likened to fire. Judgment by fire is really judgment by the Word, or Truth. In John 12:48, Jesus says, “‘He who rejects me and does not receive my saying has a judge; the word that I have spoken will be his judge on the last day. '” 2 Thessalonians 2:8 says that “the lawless one will be revealed, and the Lord Jesus will slay him with the breath of his mouth” which actually means by the Word. Similarly, Isaiah 11:4 says, “and he shall smite the earth with the rod of his mouth, and with the breath of his lips [the Word] he shall slay the wicked”. John 5:24 says, “He who hears my word and believes him who sent me, has eternal life; he does not come into judgment, but has passed from death to life. '” From these verses, it is clear that judgment by fire means judgment by the Word. Pagayam Tagamasid, I think you are just one of the few who accepted the fact that figurative terms riddled the bible. The bible is a living testament of the works of God to save man; hence it was coined as puzzles for people to conceal the secrets of heaven so that evils will remain clueless on God’s work of salvation until the opportune time of Christ coming. Jesus mentioned “I have said this to you in figures; the hour is coming when I shall no longer speak to you in figures but tell you plainly of the Father (John 16:25) and “I have yet many things to say to you, but you cannot bear them now. When the Spirit of truth comes, he will guide you into all the truth.” (John 16:12-13). A time will come that all this secrets will be unveiled right in our eyes. Some are prepared and some are not. In essence, as I have said in my previous post, the truth is just around us, we have only to recognize them. Jesus also promised, “and you will know the truth, and the truth will make you free” (John 8:32). Pagayam Bodong, ti literal a kayat a sawen ti Religion ket “Panagsubli iti Dios”. Immapay iti relihion gapu iti panagbasul dagiti immuna a lalaki ken babai. Ngarud, amin a relihion ket addaan nasayat a gagem nga ipakaamo ken isubli ti tao iti Dios. No nakasubli aminen a tao iti Dios a kas annakna (1 Juan 3:2), nalpasen ti mission ti relihion. Ti saludsud ita pagayam a Bodong, kasano tayo nga makasubli a naananay iti Dios? No dayta a relihion ket iyam-ammo na iti mannubbot a ni Hesukristo (Juan 3:16), siaayat nga awaten, ken aramiden amin a sursuro na (Juan 6:28-29). Aginga nga awan iti Dios ket Kristo iti biag tayo, ti Diablo ti adadda nga agtaeng iti kinatao tayo (Roma 7:21-23). Dayta iti makuna a turning point iti ania man a relihion. No kabaelam a lapdan ti kinadakes dita bagim iti inuran-uras, makunam nga dimon kasapulan ti relihion. Nupay kasta, dakkel ti akmen ti bukod a responsibilidad no pagsasaritaan ti pannakaisalakan. Uray pay no napintas ti sursuro ti maysa a simbaan no mapaay tayo met nga aramiden dagiti rebbeng tayo, awan latta. Nasayaat man toy palawag mo pagayam Naeling maipanggep ti relihyon, ta apo adda ka dta nga obligado ka nga agbayad ti 10 percent manipud ti bukud a sapul mo, adda ka dta madi ti kastoy, madi ti kasjay, nagadu pay unay ti pilawen da iti katoliko a relihyon, ket no agpayso ta kunam, kastoy ngarud no mamatika ti DIOS a Namarsua ken surutem daguti nasayaat a banag a pagrebbengan iti mata ti tao ken DIOS saanen a kasapulan ti adu a relihyon. Makitak pa yen ket agbalinen a business ken kas maysa a fraternity daguiti dadduma a timmubo nga relihyon. Kabsat Nailing, thank you again for taking time reading my posts. Sorry, but I think you understimate the percentage of people who believed that most of the words/sentences in the bible are written in figurative. While we recognized that there are symbolic words/sentences, especially in Daniel n Revelation,these are only few. Here they are: Lamb for Jesus, harlot-false religion, dragon-paganism, beast-religions which adhere to tradions n paganism, seal -laws, woman-church, horns-power, bread-Go’swords, ten horns-western powers,water/sea-people, and maybe a few more. So, this justifies that some 99 percent of the messages in the bible are written in figurative. I’ll enumerate some examples of of bible verses in different figure of speech if necessary, soon. On issue of new earth n new heaven, Revelation 21:1 tells” I saw a new earth n new heaven, for the first earth n heaven were passed away; and there was no sea. Sea here means water not people, because what is the use of earth without people, )only righteous )whom God loves so much? Read also Isaiah 65:17 and Matthew 5:18. Ti kangrunaan nga puntos daytoy panangparaman ti kinapudno ti pada nga tao ket panangdengeg ti pada nga tao ti Sao ti Apo nga mangator ti naalas nga aramid tapno matulongan ti pada nga tao , wagas nga maka-ay-ayo ti Dios. Arakupen tayo koma amin ti NATALNA NGA BIAG daytoy nga tawen!!!!! Agiinnayat tayo koma a sipupudno ken agkikinnapia kas kangrunaan nga BILIN ti Dios apo nga Namarsua.